Who We Are - Special Olympics Connecticut, Inc.
Who: Since 1969, Special Olympics Connecticut (SOCT) has provided year-round sports training and athletic competition for children and adults with intellectual disabilities. SOCT serves 6,500 athletes throughout the state through local, regional and state programs. In order to provide the most inclusive and meaningful school and community based sports training and competition for its 4,300 athletes with intellectual disabilities, SOCT opens its doors and offers the opportunity to an additional 2,200 athletes who train and compete as special partners alongside their peers with intellectual disabilities. Each year, SOCT hosts over 40 tournaments and competitions in 21 different venues. What: Brave souls with warm hearts will run, jump and dive into Connecticut's chilly waters donning only a swimsuit, bow tie and their courage to benefit Special Olympics Connecticut. 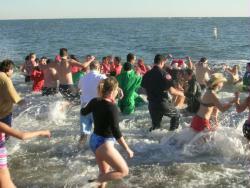 Penguins solicit donations from family, friends and local businesses to "take the plunge". Incentive prizes for different levels of money raised and awards will be given for creativity in a number of categories. Penguins can plunge alone or as a group. Gather up your friends, family, co-workers, classmates, church groups, police and fire departments - anyone who is tough enough to brave the chilly waters! Spectators are welcome to cheer our chilly friends on. Why: All proceeds from the Penguin Plunge go directly to support Special Olympics Connecticut's year-round sports training and athletic competition programs for more than 6,500 children and adults with intellectual disabilities and Special Partners, throughout the state of Connecticut.